Welcome to the 2018/2019 Year! It is a pleasure to serve the school and music program here at AHS, and this year is going to be fun and exciting. You will usually receive at least one email a week letting you know about schedules, performances, and other updates for the Band Program. 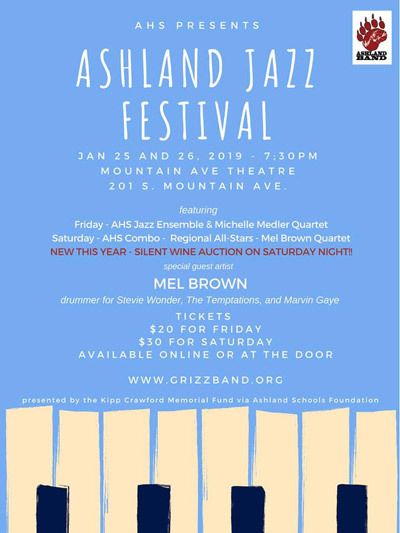 The 2019 Ashland Jazz Festival has an amazing lineup of artists – both student and professional! All proceeds from this event go to helping AHS Band and Orchestra students travel to Hawaii to perform at the Pacific Basin Music Festival! Get tickets NOW, as we are anticipating large crowds and we can’t wait to share a great night of Jazz together! Sign up for "REMIND". Remind is a great tool for communicating with large groups of people, such as a band program. With about 90 students in band, communication can be the hardest piece. PLEASE take the time to sign-up, as it will really help, especially in dynamic situations. T-Shirt and Sweatshirt Order Form. For Athletic and other community events, we wear t-shirts, and for this year, we are adding sweatshirts. The total cost for BOTH is $35, and if you'd like to add additional shirts or sweatshirts, the cost is $12 for t-shirt and $23 for sweatshirt. Instrument Need/Donation Request. As many of you may be aware, we have seen substantial growth in the percussion program, and our marching/pep band equipment is in disrepair. We've had to borrow instruments from a middle school in Grants Pass in order to help accommodate our students, and we are still missing basic things like carriers (which allow the students to perform without stands) and enough equipment to produce sounds appropriate to the level of your students. If YOU or anyone you know, may be available or interested in helping financially, please put them in touch with myself or Susan Bacon (susan.bacon@ashland.k12.or.us). We have an opportunity to get very good equipment at a very good price from The Santa Clara Vanguard, and I'm hoping we can do so before they sell it somewhere else.